These are the correct 1968 Shelby console gauges. The gauges were specially made for AO Smith by Stewart Warner. They are similar to other gauges in Stewart Warner's "green circle" performance gauge line. However, the Shelby gauges have a light socket in the back. This feature is not found on most Stewart Warner gauges. The oil pressure gauge is mounted on the left as you face it, the alternator gauge on the right. The oil pressure gauge can also be identified by the numbers "813708" in small type, on the face. The alternator gauge is number "815855". The gauges were part of Stewart Warner's deluxe line. The oil pressure wiring is unique to the 1968 Shelby. It is comprised of two wires. They are taped together. One end has two bullet style connectors that attach to the rear of the console gauge. The other ends connect to the power supply and the pressure sender under the hood respectively. 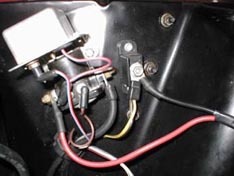 The white wire with a red stripe is connected to the oil pressure sender under the hood. Since there is already a white wire with a red stripe present in the intake manifold wiring harness (14289), this lead is cut and discarded. This leaves two wires functioning on the intake harness. The lead is usually cut where it exits the tape, near the coil. This will render the stock Ford oil pressure wire inoperative. On big block cars the wire is routed the same as the small blocks. 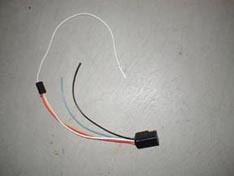 Due to the physical size of the engines, the lead cut from the stock, Ford intake wiring harness is connected to the white wire with a red stripe from the oil pressure sender. The lead is cut near the coil. 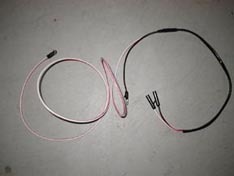 This is done using a scotch-lok connector. This will render the stock Ford oil pressure wire inoperative. The photo above shows a reproduction harness for a GT350. It should also be noted that some very early cars used a wiring harness that routed the oil pressure wiring down the left side inner fender aprons. The alternator gauge wiring has two 10 gauge wires that power the alternator gauge in the console. One wire is red and the other is black. These wires carry a lot of juice, so make sure they are in good condition. 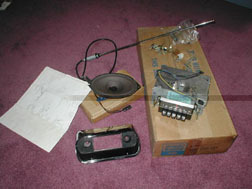 This photo shows a reproduction harness attached to the junction block and the starter solenoid on a GT500KR. The starter delay was used on all 1968½ Cobra Jet cars. This, of course, includes all GT500KRs. This little box contains a solid state circuit board. The board prevents the starter from reengagement for 4 seconds after the key is turned. This will prevent damage to the ring gear if you attempt to restart the motor. Because these delays often interfere with the snorkel, many were quickly discarded. If you wish to keep the original appearance of the starter delay, you can use a starter delay circuit board bypass wire. 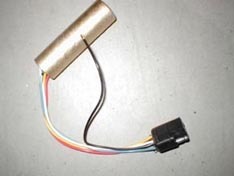 This wire bypasses the original circuit board and maintains the original appearance of the wiring. It will also repair the original wiring if it is damaged. If you need a starter delay please look at the for sale page on this website. There are two types of wiring for the rear taillights. The first picture shows a sequential delete plug. This plug allowed dealer to remove the Shelby sequencers for the rear taillights. All six tail light bulbs would operate together. The second picture shows a reproduction tail light sequencer. Original sequencers (also called dynamite sticks) have a cardboard tube. The tube is painted gold. They also have a molded plug that plugs directly into the taillight harness. The sequencers are unique to the 1968 Shelby. Cougars and Thunderbirds used a different mechanism to sequence the tail lights. Almost all the cars came with the trusty AM radio. Only a handful came with something else and we know which cars they are. Of course, your Ford dealer could have done anything to the car. 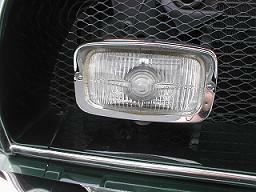 There are two different styles of fog lights used on 1968 Shelbys. The original fog light was the Marchal. It was replaced on 4/3/68 with the Lucas light. The early Marchal lights were recalled. There were several variations of the fog light wiring. There were at least two versions of the Marchal wiring and a version for the later Lucas lamps.